Sole E55 Elliptical Trainer Review by Industry Experts! 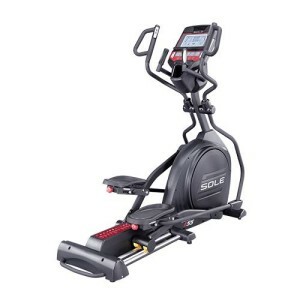 The Sole E55 Elliptical Trainer is On Sale! The Sole E55 elliptical trainer is another example of why Sole has been a dominant player in the fitness equipment industry for years. Their focus is quality engineering combined with quality components. And they recently added Bluetooth capability so you can track your workout stats using the free Sole Fitness app. And research has shown that those who track their results are more likely to achieve their fitness goals. The Sole E55 weighs in at nearly 200 lbs. The good news is it is sturdy and solid. The bad news is don’t plan on easily moving it around, particularly from one floor to another. Much of the weight is the heavy flywheel, which weighs a hefty 20 lbs. When combined with the eddy current brake system, you get a very smooth and fluid motion. The overall quality is evident when you stop the Sole E55 and it gradually slows down. Besides the smooth elliptical motion, we like the 20″ stride length on this Sole Elliptical. Which is a perfect stride length for average to above average height individuals. It just feels more natural. When you get on an elliptical with a smaller stride length you feel constrained and the motion is bouncy. To get the most reward out of your workout you want a comfortable stride. When it comes to the stride, the Sole E55 feels like a Precor elliptical. And that’s a HIGH compliment, because Precor makes premium machines that cost a pretty penny! To further add to the comfort, the foot pedals are adjustable. Another important feature on the Sole E55 is the dual wheels that ride on a beveled rail. This provides for a smooth and stable feel. Many elliptical trainers at this price range use single wheels per rail. The affect on the stability is evident. With the two wheel design you have no side-to-side motion. Bluetooth Capability – This model comes with Bluetooth capability so you can track your workout stats on the free Sole Fitness app. We like that Sole is joining the other brands with stat tracking technology. Adjustable Power Incline – The Sole E55 elliptical comes with a power incline feature, allowing you to raise or lower the elliptical motion and better target and tone your lower muscles. As with a treadmill, when you increase the incline you get a serious cardio workout. Other features worth noting are wireless heart rate control, speakers (With plug-in for MP3 and iPod players.) and built-in fan. It is also equipped with adjustable articulating foot pedals. You can adjust to the exact level for your comfort. This will reduce the need to lift you foot to the changing elliptical motion. It further reduces stress and strain to your feet and ankles. 20 lb. Flywheel — The advantage of a heavy flywheel is a more natural and smooth feeling elliptical stride. The motion starts and stops gradually with this machine. It’s interesting to us that you can get a 25 lb flywheel on the E35 Elliptical. Console – In 2011, Sole added a 7.5″ backlit LCD display to show your stats along with a 1/4 mile track graphic. The console tilts so you can view at an appropriate angle for your height. Check out a comparison chart of all Sole Elliptical models. When purchasing an elliptical trainer you want a machine that is built to last, feels sturdy, and has a comfortable and natural elliptical motion. And you want those features without having to take out a second mortgage. If you spend less than $1,000 you are buying a machine that compromises on the quality, and generally cannot withstand strenuous use. In contrast, you do not need a commercial grade elliptical to get a quality machine. The E55 elliptical is a heavy-duty cross-trainer without the heavy-duty price. Are there better elliptical trainers? Of course. Precor and the Life Fitness ellipticals are impressive machines, but they cost at least a couple of thousand more than a Sole. 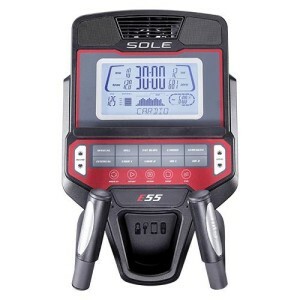 The Sole E55 is one of the best machines in the $1,500 price range. It is a value proposition when you factor the features, the quality, and the warranty. The Sole E55 elliptical trainer comes with the best warranty available – period. As mentioned it is 5-years parts and 2-years labor coverage. In comparison, a pricey Life Fitness elliptical only offers a 3 year parts and 1 year labor warranty. Sole also has a solid reputation for standing behind their products. We often get feedback about the customer service of various fitness equipment companies, and we have never received a complaint about this model. After having for 2 months, we are extremely happy with our purchase. My wife rides it 2 times a day and I once a day and it is still running smooth and quiet! The first thing that I noticed when I stepped on to the Sole E55 elliptical was that it felt very sturdy and it was as solid as a rock. The other ellipticals that I had tried were all flimsy feeling and wobbly. The Sole felt like it was anchored to the ground. That’s great but what about the stride? The stride felt very close to the Precor and the gliding action was smooth and nearly silent! I noticed a little more heel lift than I preferred but when I took a closer look I saw that the foot pads were adjustable. I was able to quickly change the pitch and guess what…no more heel lift. I was amazed! Go to www.SoleEllipticals.com to learn more! *This Sole E55 Elliptical Trainer Review is based on not only testing the equipment, but also comments, testimonials, reviews and ratings of customers and third parties. We attempt to be as accurate as possible. Warranties, features and prices can change without notice.